The Blackburn B-5 Baffin biplane torpedo bomber was a development of the Ripon, the chief change being that a 545 hp (406 kW) Bristol Pegasus I.MS radial replaced the Ripon's Napier Lion water-cooled inline engine. The Baffin was designed by Major F A Bumpus to meet a Fleet Air Arm requirement as a conventional two-seat single-bay biplane of mixed metal and wooden construction with fabric covering. It had swept, staggered, equal-span wings, the lower having an inverse gull to provide clearance for the torpedo while retaining a short undercarriage. Armament comprised one fixed, forward-firing 0.303 in (7.7 mm) Vickers machine gun and one free-mounted .303 in (7.7 mm) Lewis gun in rear cockpit, plus one 2,000 lb (910 kg) bomb, or 1,576 lb (716 kg) Mk VIII or Mk IX torpedo, or three 530 lb (240 kg) or six 250 lb (110 kg) bombs. 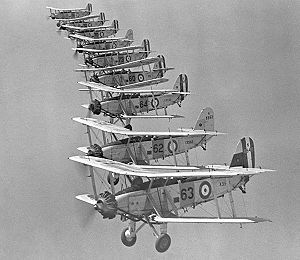 In the early 1930s the torpedo bomber squadrons of the Fleet Air Arm were equipped with the Blackburn Ripon. While the Ripon had only entered in 1930, it was powered by the elderly water-cooled Napier Lion engine, and it was realised that replacing the Lion by a modern air-cooled radial engine would increase payload and simplify maintenance. In 1932 Blackburn decided to build two prototypes of radial-engined Ripons, one powered by an Armstrong Siddeley Tiger and the second by a Bristol Pegasus, as a private venture (i.e. without an order from the Air Ministry). The Pegasus-engined prototype first flew on 30 September 1932, and after testing was chosen ahead of the Tiger-powered aircraft as a short-term replacement for the Ripon. Initial orders were placed for 26 new-build aircraft and 38 conversions of Ripon airframes, production beginning in 1933. A further 26 conversions of Ripons into Baffins were ordered in 1935 because of reliability problems associated with the Armstrong Siddeley Tiger engines powering Blackburn Sharks, and the desire to expand the strength of the Fleet Air Arm. An additional three new production Baffins had the 580 hp (430 kW) Pegasus II.M3 engine and were termed the Baffin T8A. The aircraft is said to have inspired the coining of the word "Boffin". Two prototypes and 33 production Baffins went to a training flight at Gosport for dummy deck-landing and torpedo practice, with the first Squadron re-equipping with the Baffin No 812 Squadron, in January 1934. The type went to sea with 810 Squadron on HMS Courageous, 811 on Furious, 812 on Glorious and Eagle and 820 Squadron on Courageous. In addition, 14 were sent to Malta to serve on carriers in the Mediterranean. The Baffin served barely two years before being replaced by the Shark and Fairey Swordfish, with 812 Squadron continuing to fly Baffins until December 1936. All British aircraft appear to have been withdrawn from service before the outbreak of the Second World War. In 1937, New Zealand acquired 29 of the best condition Baffins from the UK to equip Territorial Air Force (reserve) squadrons in Auckland, Wellington and Christchurch. Twenty-four were operational on the outbreak of war, 16 in Wellington and eight in Christchurch. On the outbreak of war, these aircraft were utilised as trainers. With the realisation of the threat posed by surface raiders, the RNZAF Baffin was returned to the active list, the survivors being merged in March 1940 as the NZ General Reconnaissance Squadron, renamed 1 GR Squadron in 1941 when half the strength was transferred to 3 GR Squadron. The Baffins were replaced by Lockheed Hudsons before the outbreak of war with Japan; the last Baffins were broken up at Rongotai in 1941. T.5J Ripon Mk V : Prototypes. Two built. Blackburn B-4 : Company designation of the first prototype. Blackburn B-5 : Company designation of the second prototype. Baffin Mk I : Two-seat torpedo bomber aircraft for the Royal Navy. Bombs: 1 x� 1,800 lb (816 kg) 18 in (457 mm) torpedo or 1,600 lb (726 kg) of bombs. Jackson, A. J. (1968). Blackburn Aircraft since 1909. London: Putnam. ISBN 0 370 00053 6. Blackburn Baffin Pictures and Blackburn Baffin for Sale.